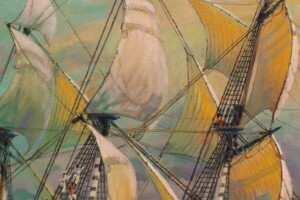 The Nelson and Trafalgar Collection, a scene from the American War of Independence. By Gordon Frickers, this painting measures 762 x 1219 cms (30″ x 48″), oils on canvas, available, price upon application. 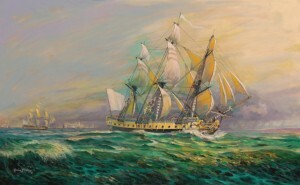 This painting was intended to show the magnificent new replica frigate built at Rochefort sur mere, launched 2014. Some how the painting talked itself into becoming a study of the original fregate Hermione, eyes of the fleet, in company with the fleet of the Marquis de Lafayette en route to support the Americans with their war for independance. The new Hermione, built for adventure on the high seas, Hermione is a story to follow. For more about this painting follow our ‘further reading‘ link. You could own this or a similar Gordon Frickers painting, payments by agreement can be made in easy stages via our ‘payments page’ or bank to bank. 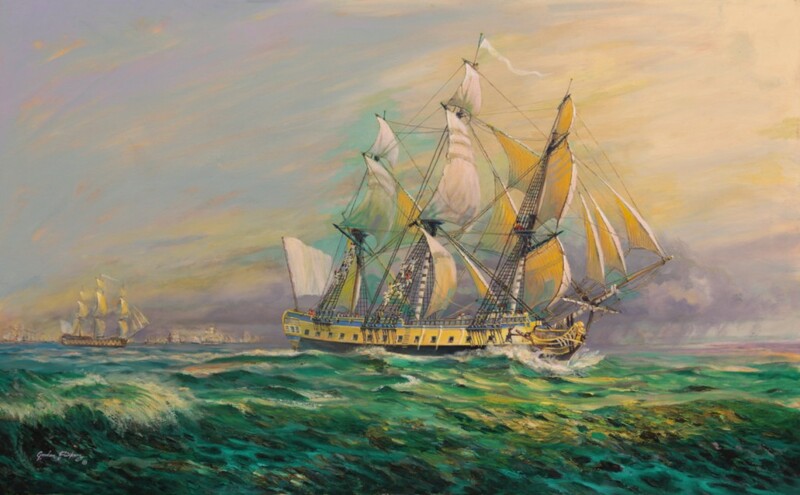 A ship that changed history:The French frigate “L’Hermione”, la Fregate de la Liberte used by Gilbert du Motier, marquis de La Fayette, significantly helped Americans win their war of independence and liberties. Captain Yann Cariou, ex-naval officer said “Above all there will be emotion. It’s still the Hermione and nobody has navigated a ship like this for two centuries“.